Italian silver plate Eucharistic Miracle of Lanciano rosary center featuring The precious Monstrance which Preserves the relics of the Eucharistic Miracle. For more information please visit http://www.miracoloeucaristico.eu/. This website is in Italian, so be sure to click on the English option at the very top of the page for the translation. 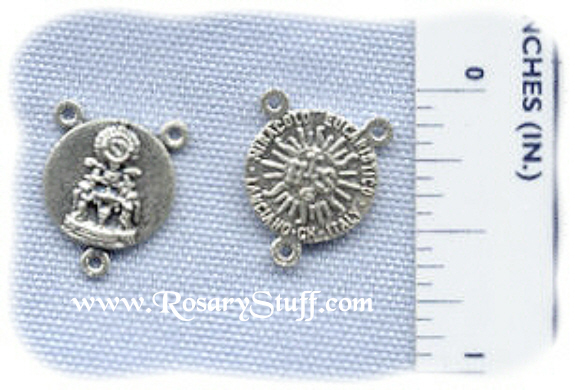 Sized at slightly under 1/2 inch tall (without bottom loop) by just under 1/2 inch wide.